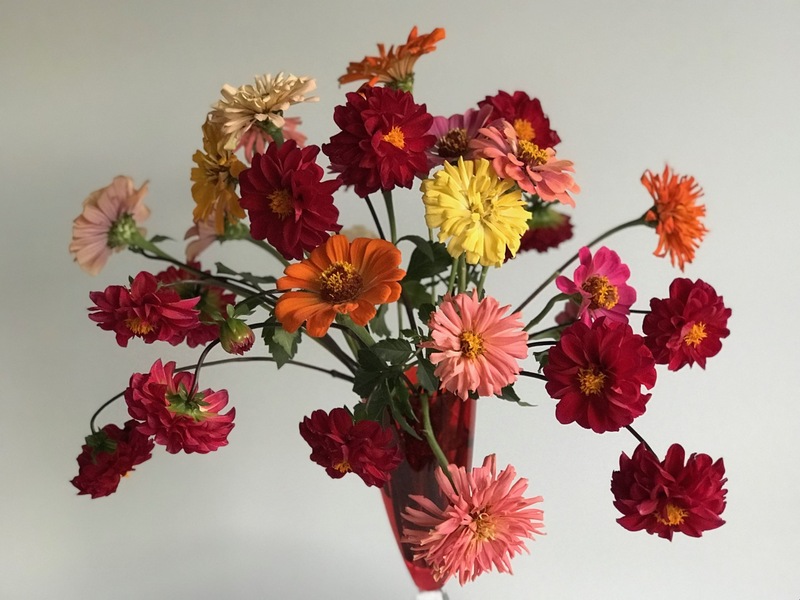 Again this week the prolifically blooming wine-red pass-along dahlias carry the day, supported by some of the last of the summer zinnias. 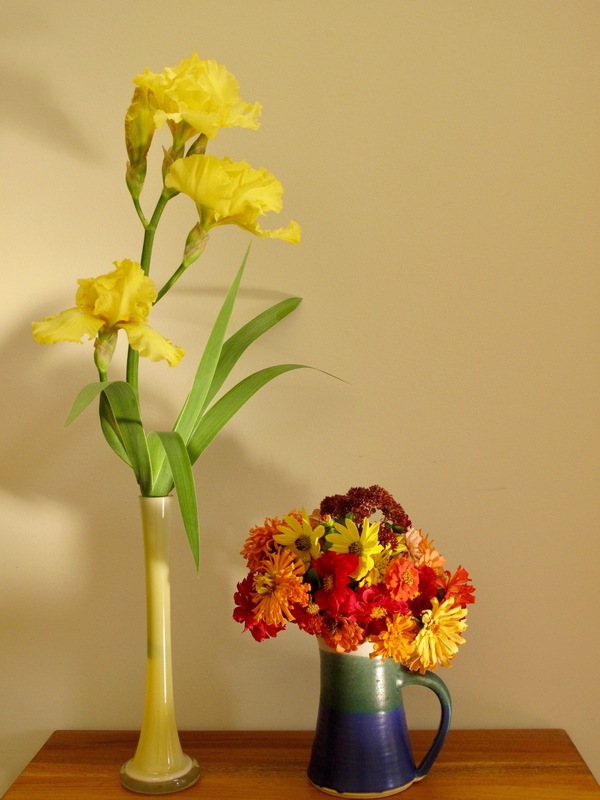 The glass container is a red-tinted champagne flute from a set purchased at a Vietri warehouse sale years ago. 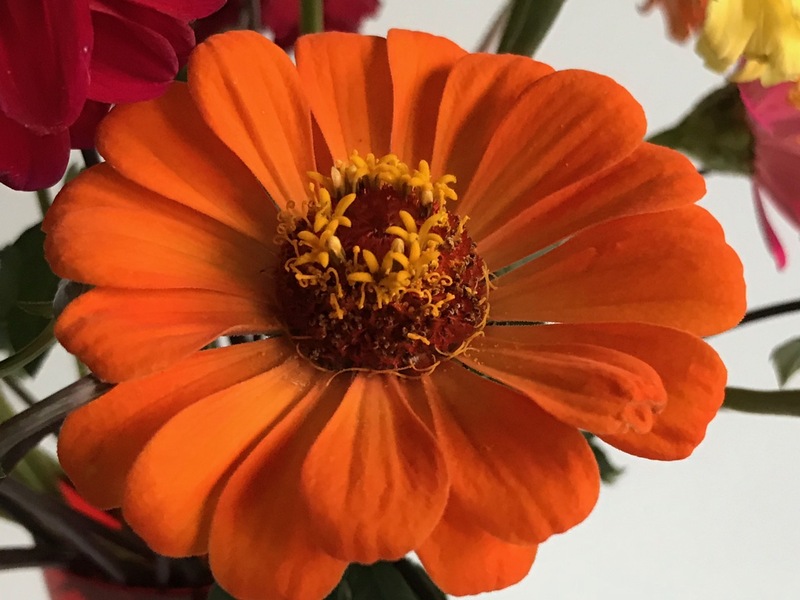 I really like the impact of the orange zinnia playing against the red dahlia. 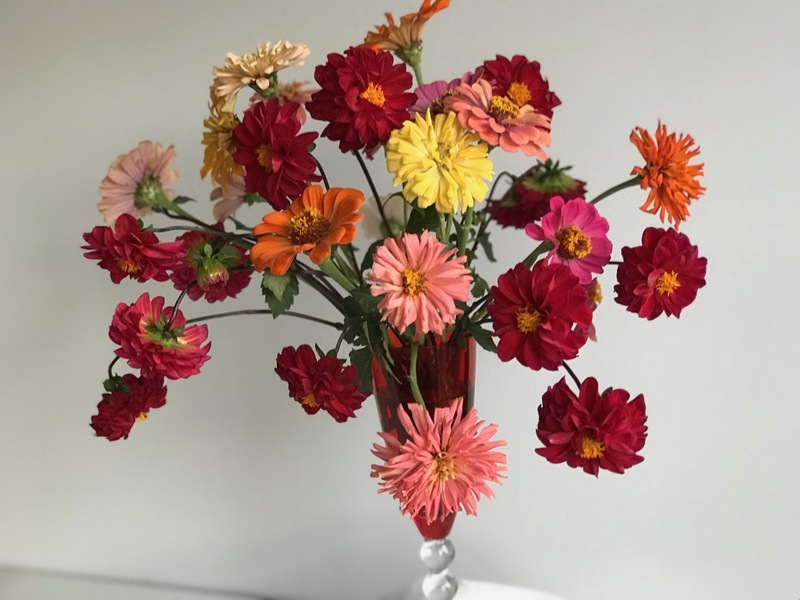 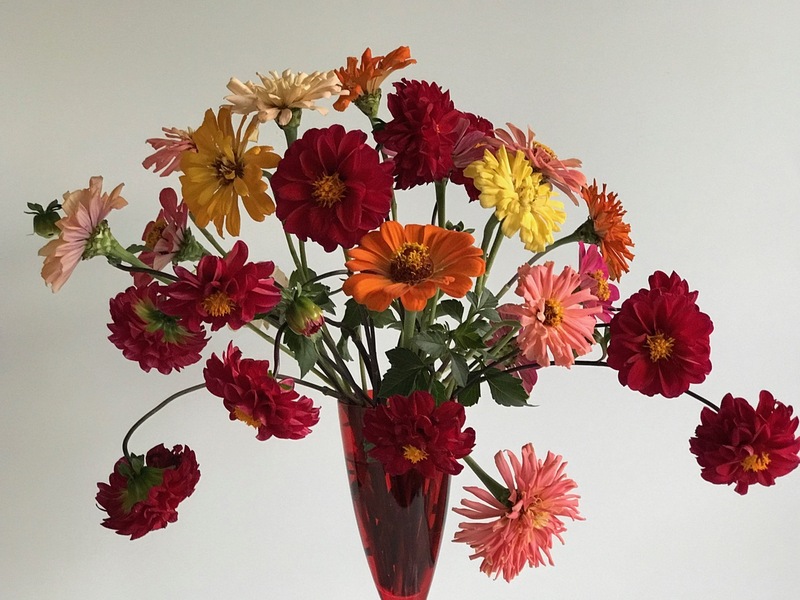 This entry was posted in garden and tagged 2017vase, Dahlia spp., flower arranging, flower design, in a vase on monday, nature photography, Zinnia ‘Cut and Come Again Mix’, Zinnia elegans ’Cactus Flower Blend’ on October 9, 2017 by pbmgarden. 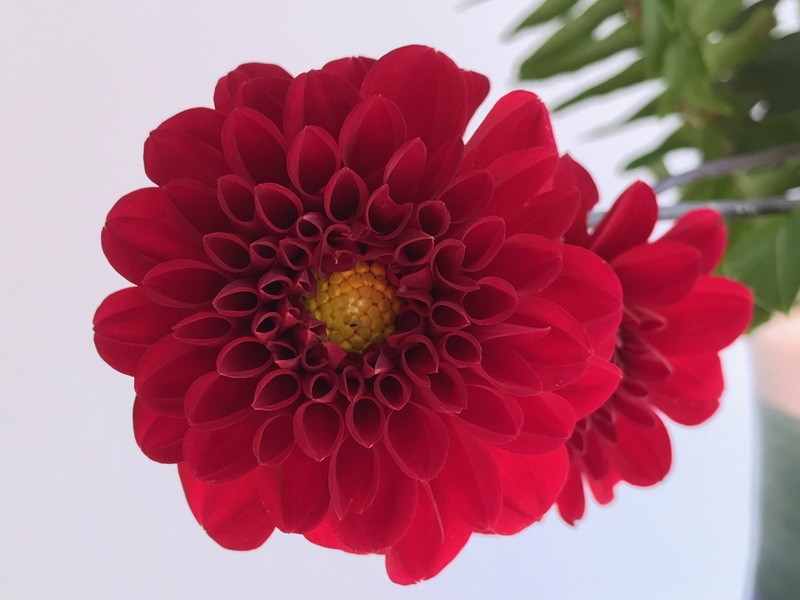 Against a backdrop of curving fronds from a potted fern, a ruby-red, passalong Dahlia (from Libby) stars in this mid-September offering. 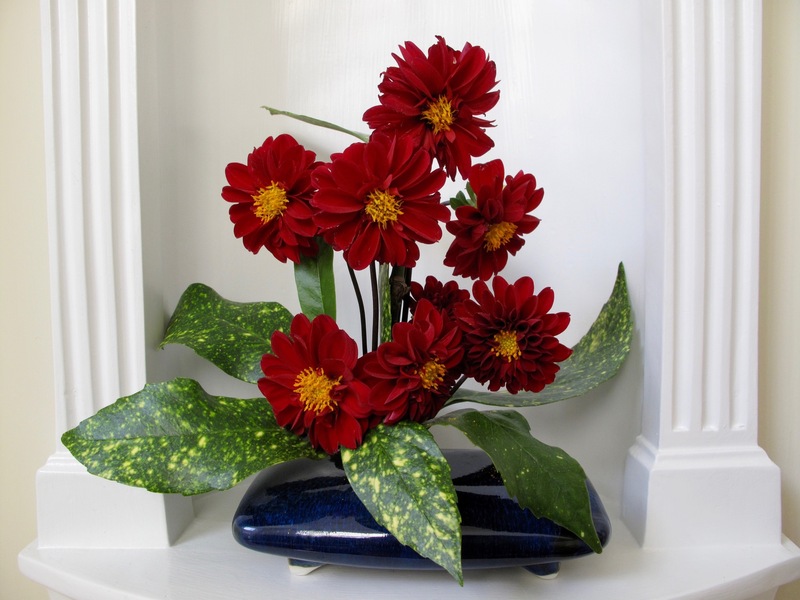 The dahlia’s deep rich color is intense, its strong geometric form is perfection. 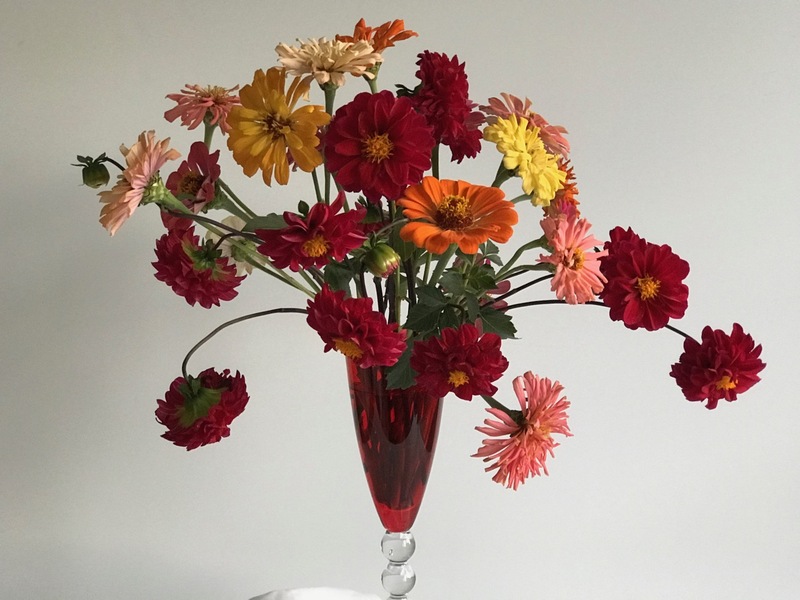 Zinnias in bold hues of orange, yellow and even pink create a secondary layer of interest in the arrangement. 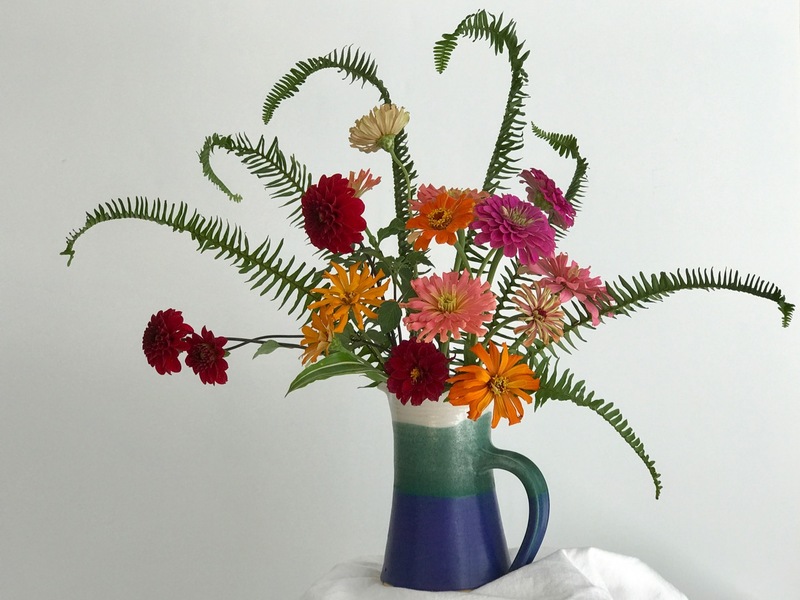 The container is a stoneware pitcher glazed with bands of cream, green, blue by well-known local potter Jim Pringle. 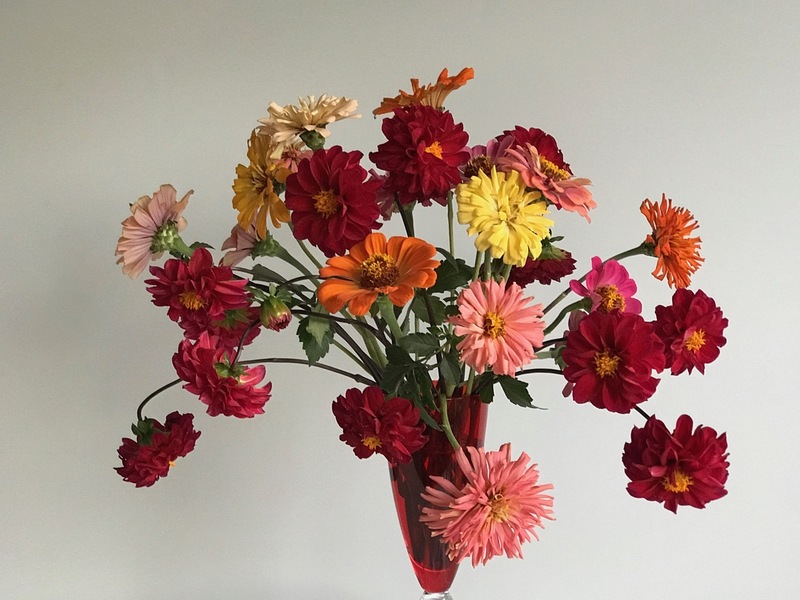 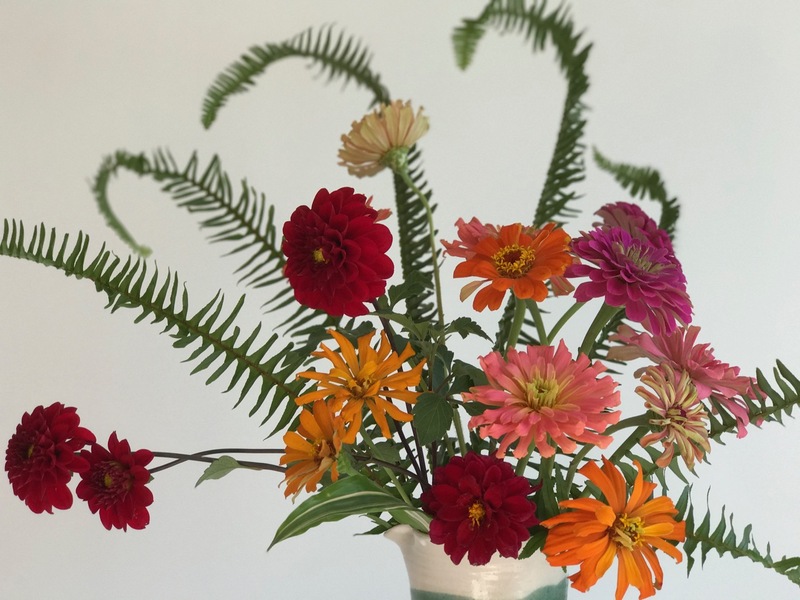 This entry was posted in garden and tagged 2017vase, Dahlia spp., flower arranging, flower design, in a vase on monday, nature photography, Zinnia ‘Cut and Come Again Mix’, Zinnia elegans ’Cactus Flower Blend’ on September 18, 2017 by pbmgarden. 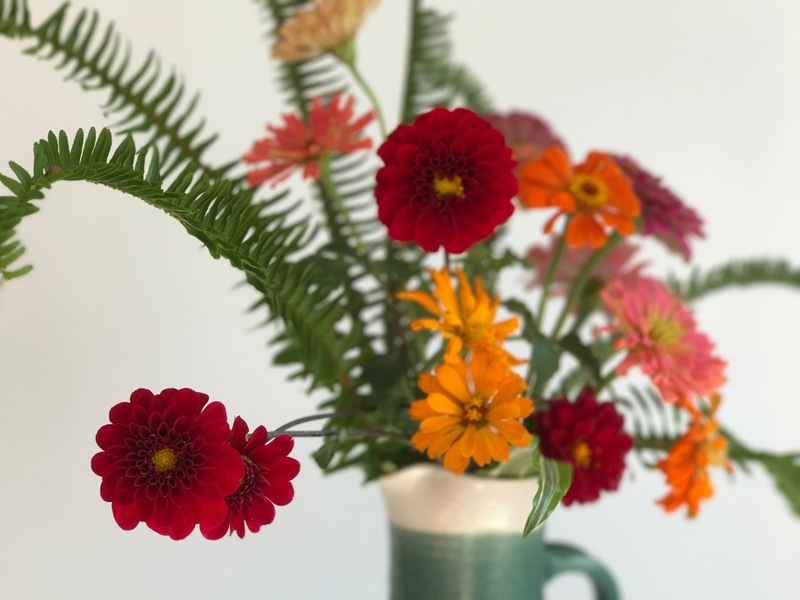 Running late as the week begins I hurriedly join Cathy with In A Vase On Monday, an opportunity to share an arrangement using materials collected from the garden. 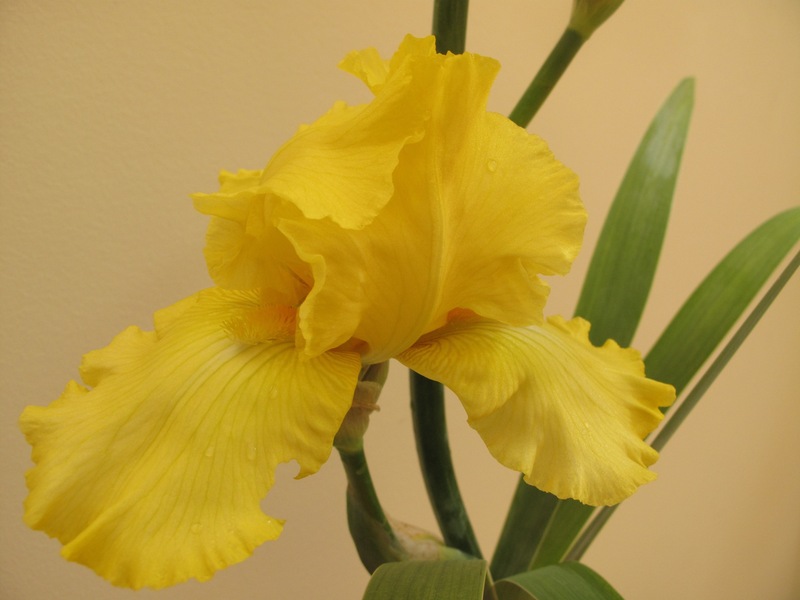 A surprise this morning when I went out to search for flower came in the form of pass-along reblooming iris. 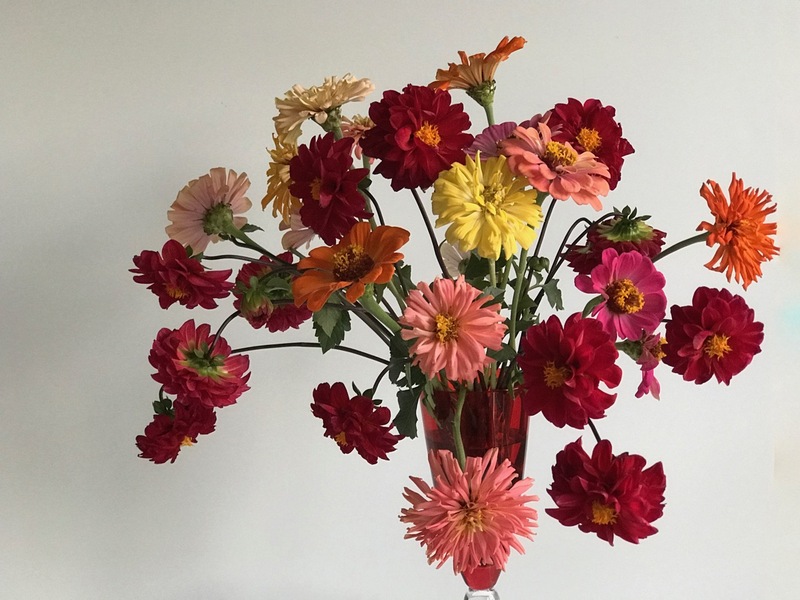 Zinnias have fallen and splayed but continue to flower. 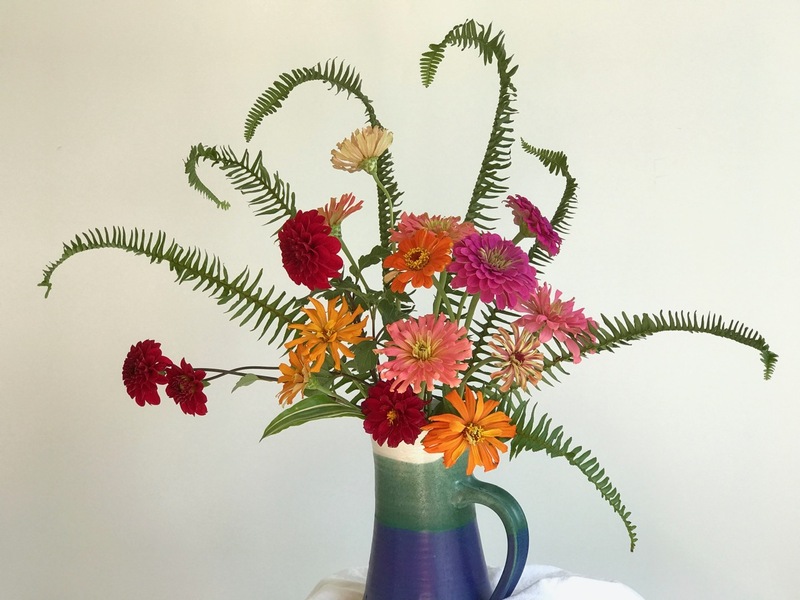 Swamp sunflower, also blown over but glorious in the morning sunlight, more pass-along dahlias (featured last week) and a stem of Autumn Joy sedum round out this week’s selections. 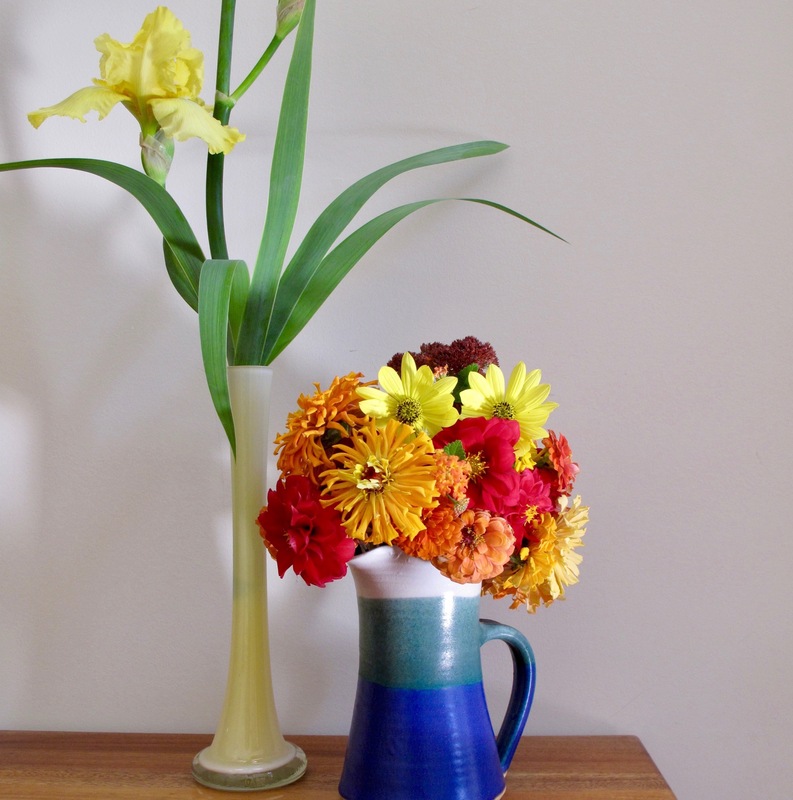 I placed these in a blue, green and white pitcher by a local potter. 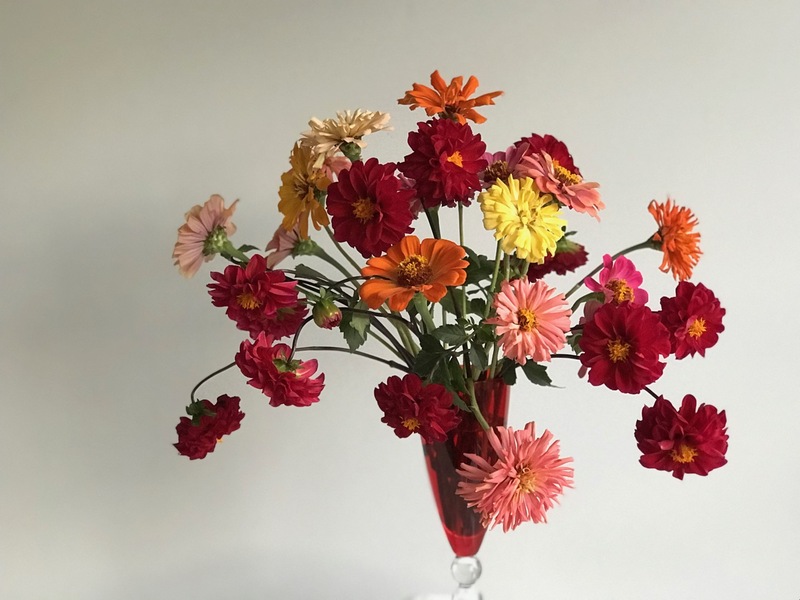 This entry was posted in garden and tagged Dahlia spp., flower arranging, flower design, in a vase on monday, iris, Lantana camara (Common lantana), nature photography, zinnia on October 17, 2016 by pbmgarden. 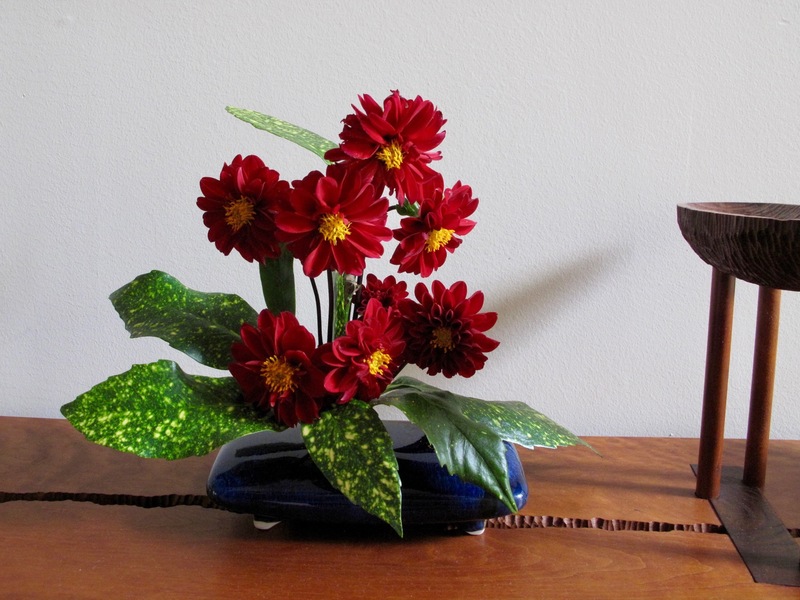 I have chosen a simple arrangement featuring a pass-along dahlia that began blooming during the past week. 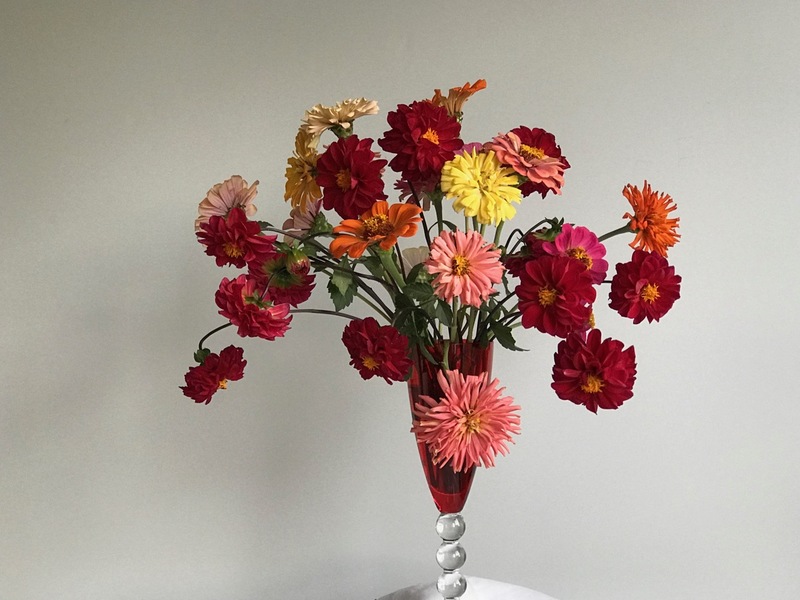 The small flowers have a nodding form which make them difficult to position with much accuracy, but their bright color is joyous. 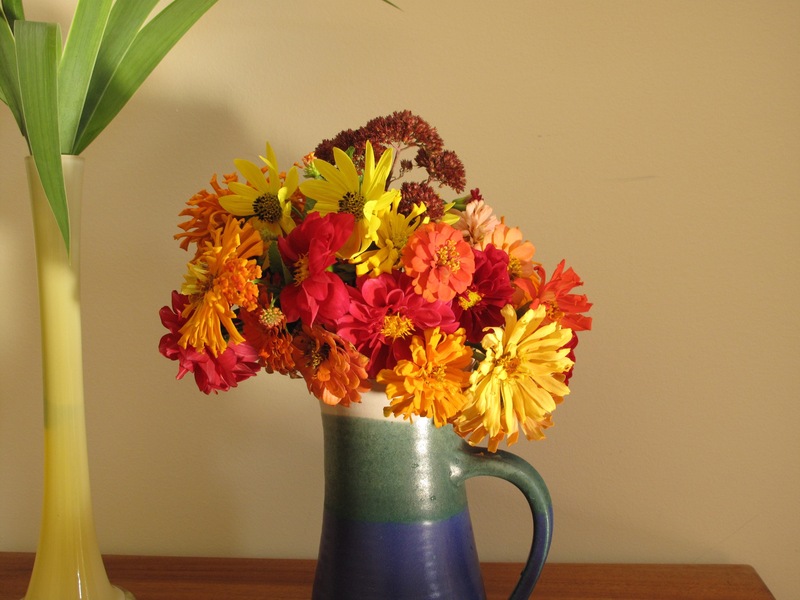 Many thanks to Cathy for hosting each Monday and giving us a chance to express our flower arranging passion. 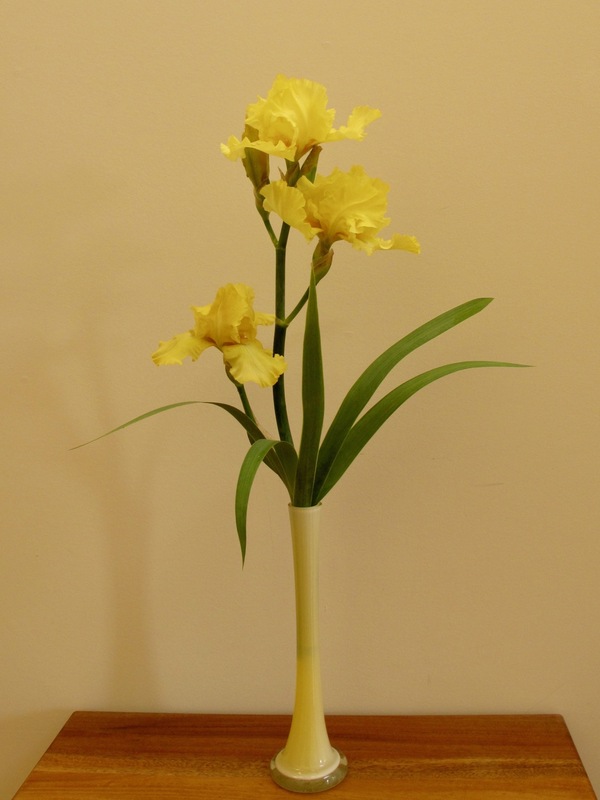 Visit her at Rambling In The Garden to discover what she and others are placing In A Vase On Monday. 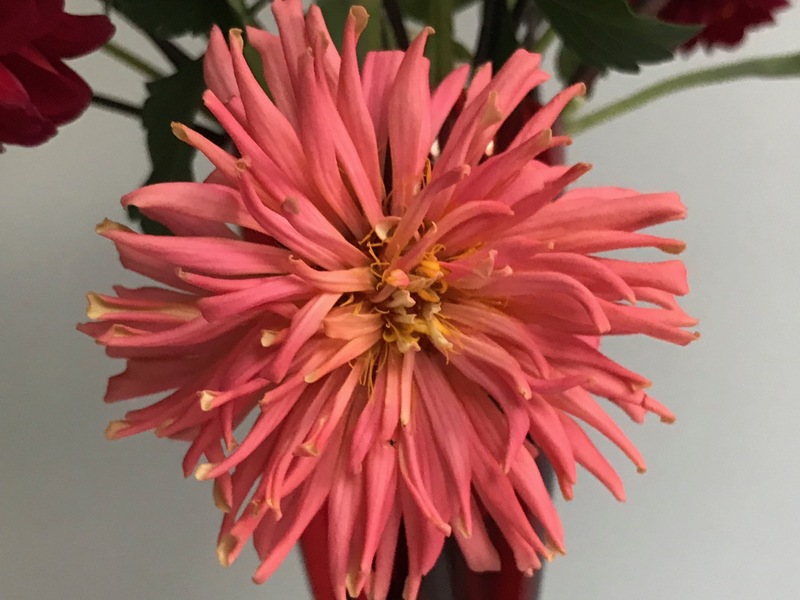 This entry was posted in garden and tagged Dahlia spp., flower arranging, flower design, in a vase on monday, nature photography on October 10, 2016 by pbmgarden.